Been picking nettle for tea making earlier – It’s practically all I drink in winter. Missy the dog gets cooked nettle in her food. Beau the bottle baby goat and Chi and Chai the chooks enjoy a nibble. 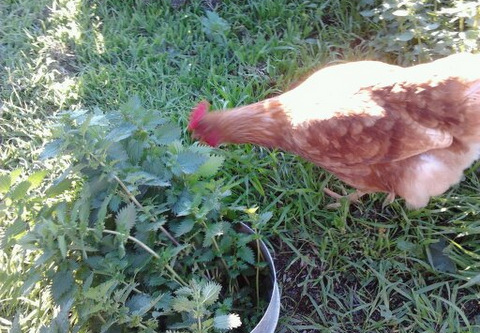 My cows like nettle as well and actually eat it fresh in the paddock when it’s low. A couple of them have some tea + cooked and they all eat it dried. 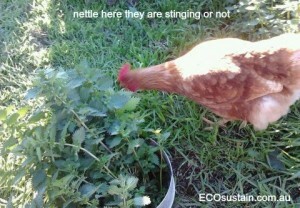 From organicweeds.org.uk – Dried nettles provide excellent fodder and is readily eaten by farm animals. If cut before flowering and thoroughly dried, nettles make excellent hay with a protein content quivalent to lucerne / clover.